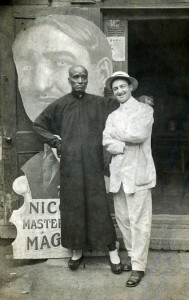 Will Nicola (seen on the right) was another globe-trotting illusionist from America. Young Will learned the magic business as an assistant in his father’s magic act and his older brother, Charles, who would gain his own fame as Von Arx, also mentored Will in the mysterious arts. Will’s first performance on his own occurred at the Trans-Mississippi Exposition held in Omaha, Nebraska in 1898. During the run of the Fair he became friends with the great Chinese magician, Ching Ling Foo, who was visiting America for the first time. Twelve years later, with his own full-evening show, Will had set forth on his first world-tour. While appearing in Tientsin, China, a familiar face turned up at the theater. It was Ching Ling Foo. This photo was taken in front of the theater to commemorate their reunion. In 1938 Nicola was on his fourth world tour working very successfully through Australia and New Zealand. From there they sailed to Java and then on to Singapore. It was during this engagement in November of 1939 that WW II broke out in Europe. Nicola thought it best to suspend the rest of his tour and cancelled his bookings in India. The show, as well as a large quantity of Chinese silk that he hoped to turn into costumes and backdrops, was loaded on board a British ship named Sirdhana. With the entire company onboard they set off for Honolulu but before clearing Singapore harbor the ship struck a submerged mine. The passengers safely scrambled into the lifeboats and then, from a safe distance, watched Nicola’s entire show disappear under the ocean’s surface. Following this disaster Nicola built a new smaller show and limited his appearances to his home country. Today he is remembered as one of the really successful globe-trotting illusionists who plied their trade during the Golden Age of Magic.